Single one part board guest checks from National Checking and Pegasus Ventures brand guest checks serving customers all across North America and beyond. Single copy cardboard guest checks from National Checking Company and Pegasus Ventures Michigan are heavier weight and more durable than similar single copy paper guest checks. The board restaurant guest checks feel something like an index card. The single one part restaurant guest checks Pegasus Ventures sells work perfectly for environments where checks are handled multiple times by servers, cooks and other staff. Pegasus Ventures also carries the Adams Restaurant Guest Checks, a company purchased by National Checking Company a few years back continuing to use the Adams Restaurant Guest Checks product numbers making identification easy for customers loyal to the Adams brand. The single 1 part board style restaurant guest checks ordered from Pegasus Ventures ship the same day or the next business day for orders received after 12 noon Eastern Time. Pegasus Ventures knows the importance restaurant owners, catering companies and food service managers place on getting orders fast. As orders ship customers are able to look at their account on this website to get tracking information to know exactly when to expect their order to arrive. Pegasus Ventures also sends emails alerting customers when their order ships. Every 1 part board style restaurant guest checks is in-stock and ready to ship today! Delivering the best customer experience begins long before the customer enters the front door. National Checking Company and Pegasus Ventures team up taking the guess work out of order taking helping eliminate a negative customer experience. Often overlooked, the importance of restaurant guest checks seem a small piece of your restaurant's service flow. Yet, restaurant guest checks improve the overall customer experience by reducing order- entry mistakes while helping the flow between kitchen and wait staff. 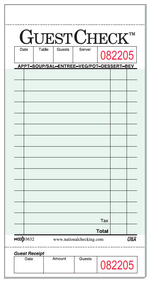 From traditional green guest check paper pads to a complete line of custom printed restaurant guest checks, Pegasus Ventures Michigan and National Checking Company improve your restaurant’s profitability and efficiency.